The most popular thing to do on the Great Wall is HIKING, i.e. walking on the wall. Besides hiking, you can do a night walk, camp on the wall, enjoy a picnic with great mountain views, run a Great Wall marathon, and take a roller cart down. You may have seen beautiful pictures of the Great Wall below blue sky and white clouds. But have you seen Great Wall glowing at night? 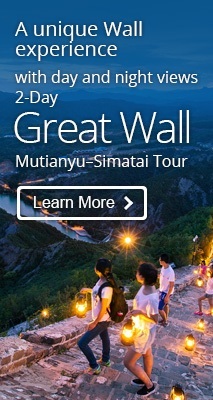 Simatai’s Great Wall section offers night access for a short distance. The Great Wall will be lit up at night between the 5th and 6th watchtowers. There is a well-paved path up to the wall. On Simatai’s wall at night, you can have a beautiful view of the brightly lit Gubei Water Town resort at the bottom of mountains. After your night visit to the Great Wall, you can relax at the resort area, which offers up to 5-star hotels and hot springs. See our 3-Day Secret of Beijing Tour — appreciate the stunning views of the Great Wall by night. If you are an outdoor lover and want a special experience on the Great Wall, camping is a good choice. Gazing down from a Great Wall ridge, and listening for sounds in the night, you could imagine how China’s northern sentries felt keeping watch centuries ago. The best season for Great Wall camping is early autumn, before it gets too cold, with less cloud in the sky. Then you can best enjoy clear views of the Great Wall winding its way along the mountains during daytime. If you are lucky enough, you may also able to appreciate the milky way at night. 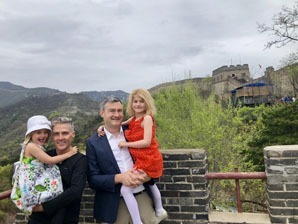 Read more about The Great Wall at Jiankou — Wild and Perilously Steep. 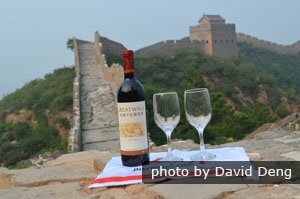 Enjoy a picnic on the Great Wall. If you enjoy picnics in the great outdoors, you should have a picnic on the Great Wall during your China trip. There is little choice for restaurants when visiting the Great Wall. If you are going to do a 5-hour hike, you should prepare some snacks in case you need more energy. Why not bring a picnic too? Touring with China Highlights, our tour guide will help prepare food and drinks and carry them for you on the Great Wall. You can have a picnic in a watchtower during your hiking trip. It will definitely make your Great Wall hiking trip more memorable, as you imagine the conditions the garrisons and wall workers endured as they ate. The Huangyaguan Marathon was first held in 1999, and has become very popular for its challenging route, stunning Great Wall scenery, and quiet Chinese villages. It’s one of the 10 coolest marathon routes. It attracts runners from all over the world. Participants not only need to run, but sometimes need to scramble with their hands and feet on the steep Great Wall. You can enjoy Chinese village views and kind volunteers hand out water and snacks. Children from the villages come to high-five with the runners. Besides the village scenery, you can appreciate the most colorful season at the Great Wall. Pure white apricot and pear blossoms make a gorgeous view along the way. Read more about The Great Wall at Huangyaguan — Longest Restored Section, Marathon Venue. 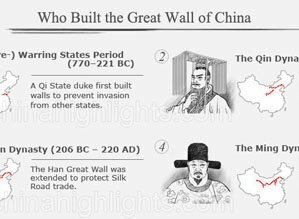 The Great Wall was built on mountain ridges. 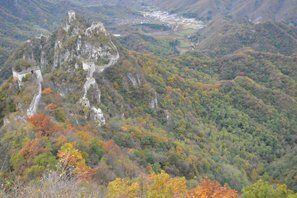 So, to reach the wall, you will usually need to hike up mountain paths for about 1 hour, and you will also need to hike down. Luckily, some sections offer cable cars so you don’t have to do the hiking up and down. At Mutianyu there is another fun way to get down from the wall: roller coaster carts. Michelle Obama has ridden a roller cart at Mutianyu. 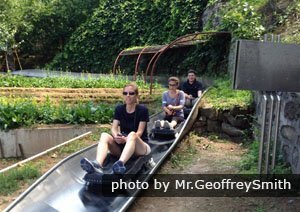 You too can sit on a cart and roll safely down to the valley, like the former first lady. If you are planning a Great Wall tour and want to experience the interesting things above, don’t hesitate to let us know. 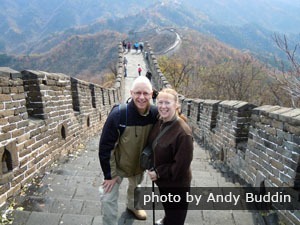 Or you can start to create your own Great Wall tour here by telling us your interests and requirements. 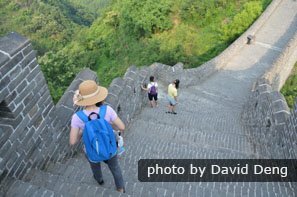 1-Day Jiankou to Mutianyu Great Wall Hiking Tour: Challenge the steepest section at Jiankou. 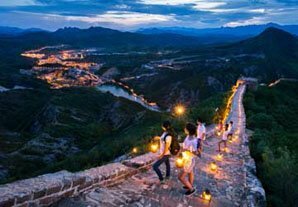 3-Day Secret of Beijing Tour — appreciate the stunning views of the Great Wall by night. 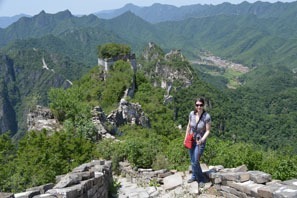 5-Day Discovery Great Wall Hiking from Jiankou to Gubeikou: Hike on wild and restored sections.